Brrrr! Is it cold where you are today? The temps have really dropped here in GA! With this lag period between Thanksgiving and Christmas, I have been pondering how I'm going to decorate for Christmas this year. I'm sure many people do that (here in blog land especially) and others just put things back up the way they did it years before. We bloggers though like to change things up a bit though, don't we? One thing I saw somewhere was this little project. Now I am not a big crafter. If it isn't simple and inexpensive, I just don't do it. But, I do love to make some things so that not everything in my house is store bought and mass produced. I think it gives my decor a little something extra that way. So, this is what you'll need for this simple project. 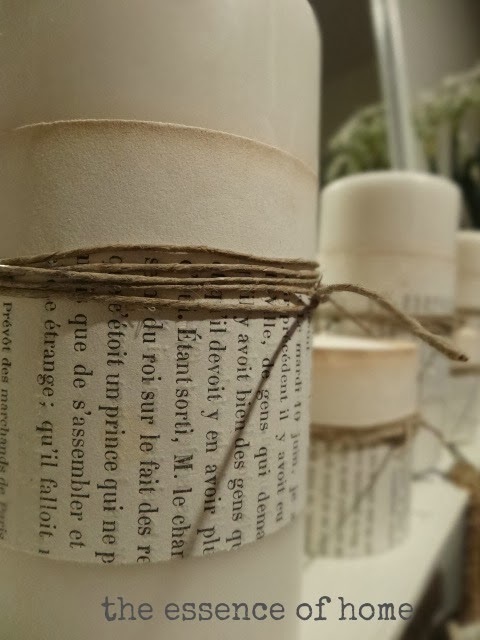 Some pillar candles, old book pages, tape, twine and scissors. Easy Peasy right? You probably already have this stuff in your home too. 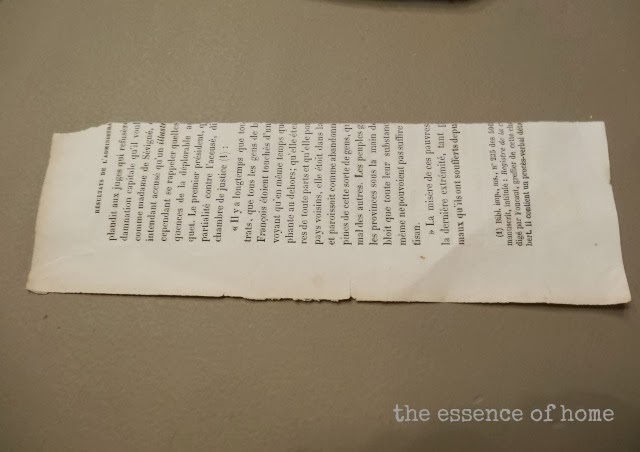 First tear or cut a book page down the center. 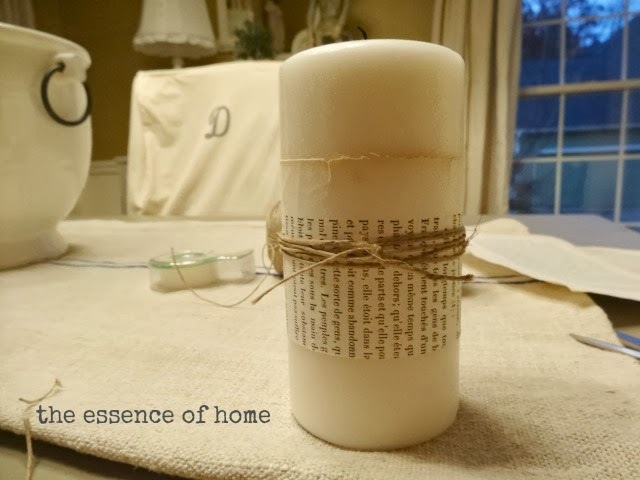 Then wrap it around your candle and tape it. Now, if your candles will be used so that all sides will be seen you'll need a large enough book page to wrap completely around it. Mine will not be, so I'm not worried about it. Here is what the front will look like. 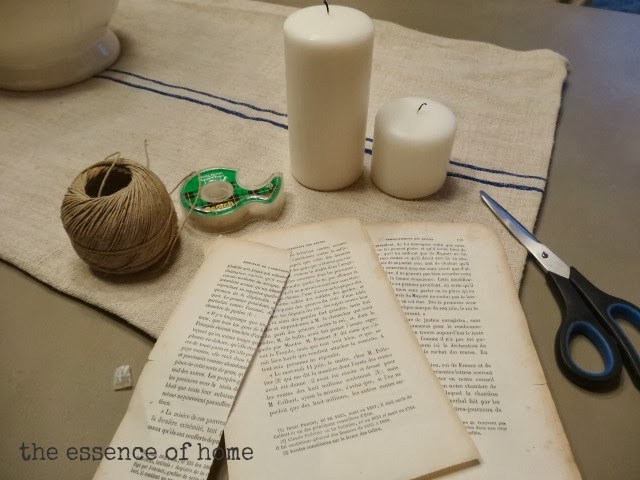 Then, cut off a very long piece of twine and wrap it around the candle several times to get a thick band and tie it in a knot. Cut off any extra. At this point, you could add a charm or something interesting to it, but I left mine plain. A sprig of greenery for Christmas would look cute tucked in the twine too. Now, I've been playing around in my house trying to figure out my Christmas decor. No! I'm not setting up a tree yet and hanging lights. Just working on basic stuff. So, these candles will most likely be used in my Christmas decor this year. Just sayin. And there you have it! It has that creamy vintage look I like so much. Are you planning your Christmas decor yet? Oh yes, I bought some things at Target and can't wait to put them on my mantle, the grandkids will love it and that's what it's all about. I love your candles and I'm going to make them or at least try to, maybe after I make some garland! lol. Simple and yet elegant! That is so your style!!! This would be a good project for the (older) grands! I am gearing up to decorate. First -COFFEE and our reading then I am biting the bullet and digging in!! I went back yesterday to look at my pics from 2011. I overwhelmed myself!! That is a great project. I am in the middle of my planning. I am doing things a little different this year I think. I love this! I think greenery would look great and I have that monster rosemary plant! lol! Thanks! I'm making notes in my phone left and right, whenever I see an idea I can't Pin. I'm excited that we are going to do things earlier this year and I will have more time to add new things and tweak a little. love this. i remember seeing a tutorial where they used bookpaper tissue and melted it in.. 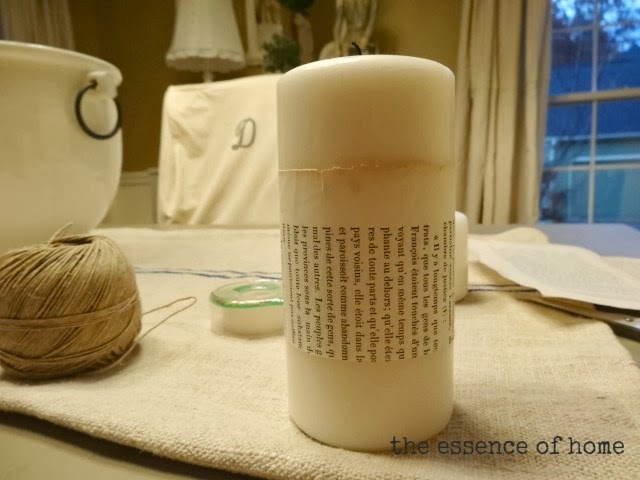 Adding the page and twine adds great texture to candles. Love this look! It's very pretty, Kelly! I had planned to do something like that before tomorrow, but don't think I'm going to have the time. No, not ready for Christmas. Just not feeling it. I always like this when I see it, I just haven't done anything like it. I don't start decorating the inside of house until day after thanksgiving. I'm a one holiday at a time gal. I love your candles looks like something I could make. I just need to find me some old books.. Your candles are lovely Kelly! Great candles, Kelly! I think a sprig of greenery or rosemary, for remembrance, would be perfect. I love projects like this...quick and easy and make such a big impact. I made some with sheet music a few years ago and i'm still using them in my décor...I'm sorta planning my Christmas decorating too, would love to start the weekend after Thanksgiving but that Saturday is the Iron Bowl and I might not be in the mood after that if Auburn doesn't win! Very simple and very cute. I'm sure you'll find the perfect spot for your decorated candles, Kelly. I don't know where to start in my house this year. There are too many unfinished projects in the living and dining room, but I guess I'll just have to deal with it! It's in the teens here with a wicked wind. Brrrrr. Kelly, The candles are really cute! Last year I made some using tissue paper and a hair blower. Perfect candles :-) Made some similar last year using , of all thing, a phone book. Ha!! Have to redo the paper I think. Thanks for the inspiration. Love the candles!! I might have to try making some of these. My sister has been making Christmas trees out of old books. I've been thinking about putting some of my Christmas décor out next week before Thanksgiving, because my show is on the Friday, Saturday, and Sunday right after Thanksgiving...and I'm so tired for a few days after this show is over. I love easy peasy projects! !…and this certainly is easy and beautiful Kelly!! !…Started my Christmas decorating….but have a ways to go!!! Have a wonderful weekend…stay warm! Those are lovely candles!! I agree with you...always wanting something that has a personal touch as well and a little different. Every candle I have is plain cream color. I should spruce them up. Hey maybe use a spruce twig too! Kelly, I love this, candles and Christmas just have to be too me!!! These candles are so much fun to change out for the different seasons and I like how you did yours. If this cold that I have,is better by tomorrow, then I will start decorating my home for Christmas. This is a great idea. Love that it is simple but makes a statement. I love the natural decor too. I can't wait to see al your decor this year. I will definitely going to give this project a try. This is really cute. And the good thing about this project is that it is easy to make and it is inexpensive. Very pretty and simple too. 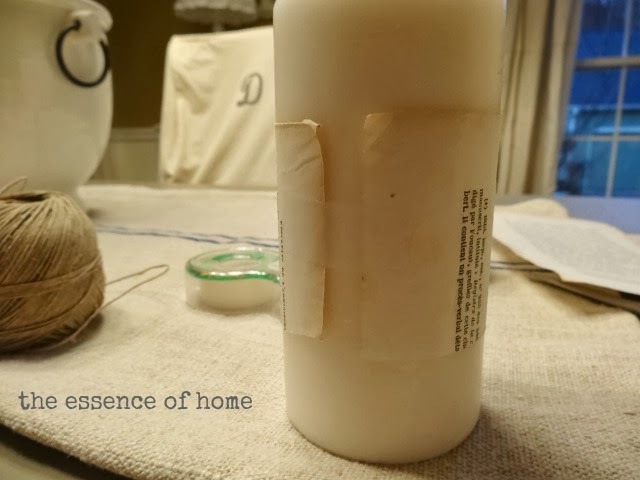 I did almost the same thing with birch bark and I find they can be used in many seasons.